Even though I made a pun in the title of this post, this is a very serious subject. With value of the land increasing in deeply populated areas, it seems even the place for the final rest is getting more expensive every year. Cemeteries are getting more crowded, and no wonder, since people have been dying all the time. Korean architect Chanjoong Kim, founder of the System Lab has a great solution for this problem. 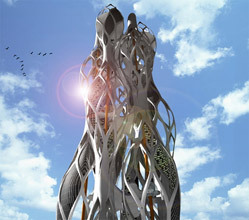 He designed “Columbarium – The Last House”, a vertical cemetery tower that’s 110 meters high and has a design inspired by the vascular system in the human body. This project was created for the Biennale di Venezia 2006, and the architect’s vision for the future of vertical cemeteries will be brought to reality in a structure made from pre-fabricated steel components finished with titanium and solar panels that adorn the ash containers. With the solar power it generates during the day, this tower will also be a source of green energy to the city of Seoul. The individual ash containers will be activated by mobile phone. Along the floors, people could pay to their respects to their loved ones peacefully, and in the future, the Columbarium could also be a social gathering place. Find out more about The Last House.